The Denver Center for the Performing Arts 2015-16 Broadway season features Tony Award-winning hits and family favorites straight from Broadway including “Matilda The Musical”, “If/Then” (national tour launch), “Murder For Two”, “A Christmas Story, The Musical”, “A Gentleman’s Guide to Love and Murder”, “Disney’s Newsies”, “Beautiful – The Carole King Musical”, “The Book of Mormon”, “Disney’s The Lion King”, “Dirty Dancing – The Classic Story on Stage”, “The Wizard of Oz”, “Riverdance – The 20th Anniversary World Tour”, “Once”, “Disney’s Beauty and the Beast” and “The Sound of Music”. The season starts with “The Book of Mormon” Aug. 11 through Sept. 13. Subscriptions start as low as eight payments of $26.13 and are available by calling 303-893-4100 or by visiting www.denvercenter.org. Additional subscriber benefits include preferred seating, free ticket exchanges and various special offers throughout the season. 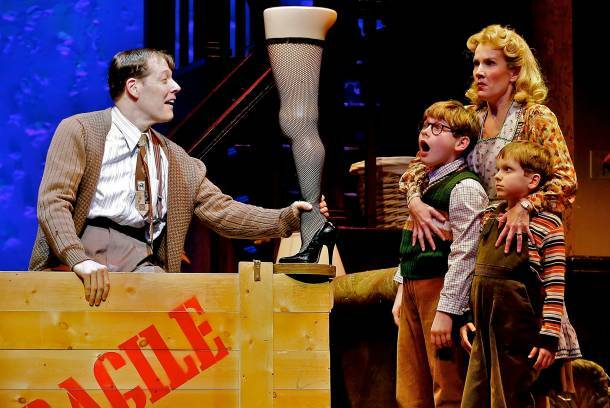 ‘A Christmas Story, The Musical” is just one of the shows on the Denver Center’s 2015-16 theater season.